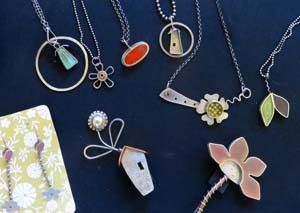 Sterling silver earrings, brooches, and necklaces by Jennie Milner are on display at Wadoo in Fort Collins. J.C. Milner Metalworks. It’s a serious-sounding name for the business of the artisan who produces some of the most whimsical jewelry I’ve seen in my six months of visiting art festivals and galleries along the Front Range. Playfully executed birds and birdhouses, flowers and leaves are ever-recurring motifs in Jennie Milner’s jewelry and other art. If you know the 1990 song “Birdhouse in Your Soul” by They Might Be Giants, you know just how playful Jennie intends her work to be. She loved that song from the first time she heard it and picked the line “Build a little birdhouse in your soul” as the theme for her art. A strip of brown paper filled with doodles of jewelry ideas runs the length of two walls of Jennie’s studio. Below it hang the no-nonsense tools of a metalworker. 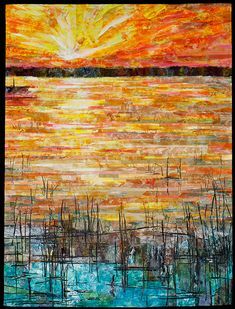 Nothing could be more perfect to represent the two sides of Jennie Milner, I thought, when I watched Jennie work last week at her studio in Fort Collins. A wall runner of jewelry doodles reminds Jennie Milner that she has endless ideas to choose from. A rolling mill imprints a floral design on a fresh piece of copper. 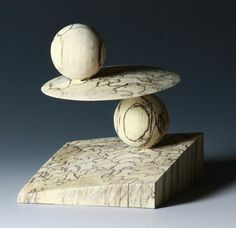 Jennie Milner uses her own designs for all elements of her metalwork. 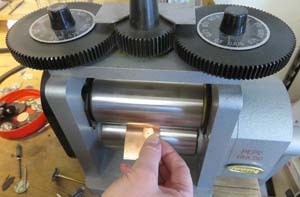 It all starts with a plain piece of metal, Jennie told me, pulling out 2-inch squares of copper and sterling silver. The silver square she showed me had an interesting texture on one side. That’s the impress of a paper towel, she explained. Metal is so malleable before it’s finished that even paper alters its surface when it runs through a rolling mill. 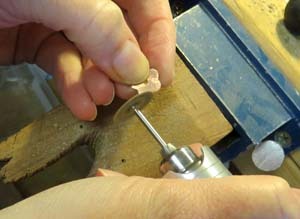 In the photo at right, Jennie uses a flower design previously cut from copper to make another flower. She had adjusted the knobs on top of the rolling mill to allow the two pieces of copper to slip between the rollers with the right amount of pressure to make an imprint on the new piece of copper. For a new flower design, she could make a pattern from heavy paper and achieve a similar result. Jennie Milner uses a jeweler’s saw to cut around the imprint of a flower design in copper. Next came the part where I held my breath. Jennie used a jeweler’s saw to cut around the flower imprint she had just made. In the picture at left, she firmly holds the copper against her bench pin with one hand; with the other hand, she runs the saw straight up and down around the flower petals. The saw “blade” is simply a piece of wire — further proof of how soft metal can be. I lost count of how many passes it took Jennie to make her way around the tiny copper flower. By the way, Jennie saves all of her metal scraps and sends them off to be melted down and recycled into sheets like those the scraps came from. An electric sander smooths sharp edges of a newly cut copper flower by Jennie Milner. To smooth the cut edges of the new copper flower, Jennie grabbed her electric sander. Its shape and size and the way it hung suspended nearby reminded me of a dental hygienists’ brush. 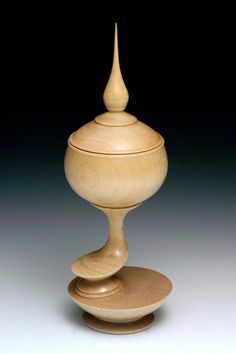 When Jennie was satisfied that all of the petals’ edges were smooth, she put it in her tumbler – a small watertight container filled with water, a squirt of soap, and small pieces of stainless steel. After seeing how malleable metal is, it was hard for me to believe the stainless steel wouldn’t damage her work. Yet tumbling is a standard way that metalworkers clean and polish metal. After several hours, the small copper flower would come out of the tumbler ready to use as an element of a brooch or pendant or earring. Next Jennie turned to her piece of sterling silver. She had already dipped it in “liver of sulfur,” a gel that tarnishes silver evenly. After the silver turned black, she rinsed it and sanded it lightly. The result: silver that looks brushed rather than bright. In metalworker’s language, the silver now has a patina. It would become the back of a leaf-shaped pendant. 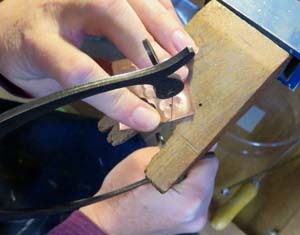 Jennie Milner solders the ends of sterling silver strip wire to form the outline of a leaf. Heat blackens the metal, but polishing brings out a soft patina. First, however, she clipped off several inches of sterling silver strip wire which would form the edge of the leaf. (Wire in this case is really a long strip of metal about 3/8” wide.) 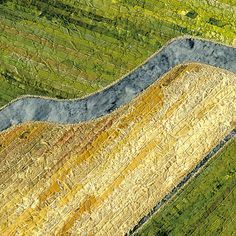 By pinching the strip in the center and curving its ends toward each other, she formed the basic outline of a leaf you see in the photo at left. Then she took the tiniest piece of silver anyone could possibly pick up and set it right where the ends joined. That’s the piece she is melting with her torch, not the outer rim of the pendant-in-process. Fueled with acetylene, the torch provides the 1675⁰ of heat necessary to melt silver. The trick was to keep the flame moving so it would heat the strip wire but not allow it to melt. Soldering is the part of jewelry making that makes Jennie hold her breath. 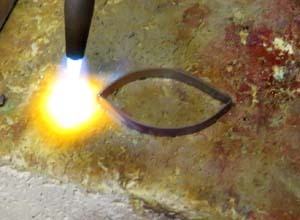 There would be more soldering, cutting and sanding, cleaning and polishing before the leaf was ready for the next step. It’s possible that by the time it’s finished it will look something like the leaves in the photo at right below. 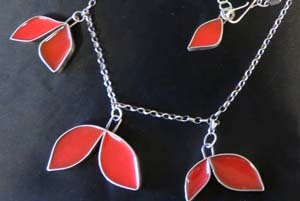 Acrylic paint mixed with resin colors leaves edged and backed with sterling silver in this design by Jennie Milner. As an artist, Jennie loves color. When she studied metalworking at Colorado State University, she loved the color she could achieve with enamel . . . but she found the process onerous. Instead, Jennie uses resin, specially formulated for jewelers, as a base for adding color to her work. 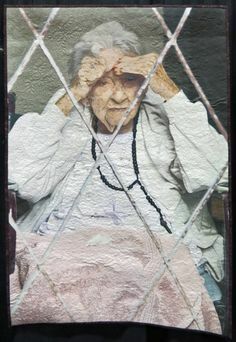 Resin lends itself to all kinds of creative color media; acrylic paint, chalk pastels ground to powder, even Martha Stewart scrapbooking beads are some of Jennie’s favorite choices. Speaking of Color . . .
Jennie Milner created this small diorama as an example of her imaginative art for the Fort Collins Studio Tour last June. A small bird made of silver is looking up at flowers on the roof of its silver vehicle. This winter, if you happen to have a day when SAD is getting you down, try clicking here. (Then be sure to scroll down slowly.) Jennie does a lot more art than jewelry – you’ll be surprised at some of the places you can find it. It’s hard to look at it and not smile or get lost in Jennie’s creative world. 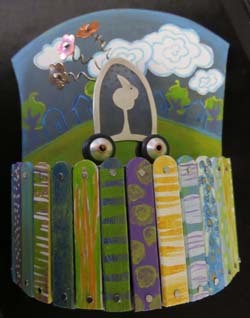 Jennie offers her zany, creative art monthly by subscription through Etsy. To try out her jewelry, drop by Wadoo in Fort Collins or Metro Frame Works in Denver any day of the year. Check Jennie’s website for other locations in Colorado, California, and Florida. Her contact information is there, too, in case you’re wanting something in particular. In case you would like to watch Jennie at work, she has three brief videos posted on the left sidebar of J.C. Milner Metalworks on Facebook. Watch her page for announcements of workshops later in 2015. One day I was walking through Old Town Fort Collins and spotted one of several cheerily painted pianos that sit outside in warm weather. I looked it over and thought, “Wow, this looks like Jennie Milner’s art.” I looked around at the side of the piano and there was the artist’s name: Jennie Milner. I didn’t know that Jennie had painted one of the city’s pianos – so I was especially delighted to have spotted it. 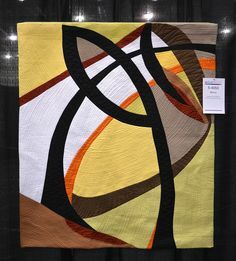 Her playful designs exude a creative flair that is uniquely Jennie’s. 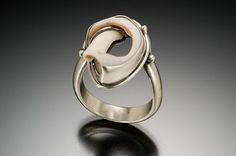 This entry was posted in Jewelry, Metal and tagged copper, Jennie Milner, jewelry, resin, sterling silver, Wadoo on December 17, 2014 by Sally. I love this blog posting. What a talented person Jennie is. I’m inspired to buy once last Christmas gift for my daughter! Your comment will make Jennie’s heart sing, Kathy . . . probably “Birdhouse in Your Soul.” It makes mine sing, too.